The fall of 2013 or ’14, I sustained a neck hyperflexion injury, which means bent forward, chin to chest. While playing for my old team, the Menagerie, we faced off in a friendly scrimmage against my current team today, the Valkyries. 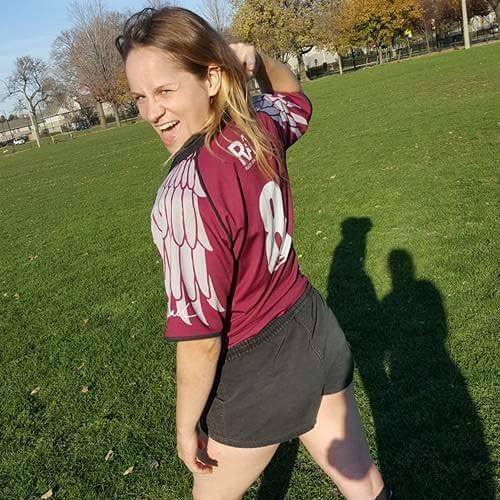 For the Menagerie, I tackled one of the Valkyries’ props, but I was tired, and I am petite for a rugby player, no less against a prop, so instead of driving her backward, because I wasn’t sure I could, I pulled her on top of me. Somehow, I got hunched over and she landed on the back of my head and neck, bending them both forward farther than their natural range of motion. My neck and back muscles sustained tears, a lot of vertebrae cracked, and with each one I was afraid the next one would kill or paralyze me. I yelled out from underneath her and somehow I was released. I stayed still laying on my back to see if I could feel all my fingers and toes. I shouldn’t have gotten up, but I did and almost went back in the game before I thought better of it. My teammate, “Doc,” a real MD, briefly examined me, but it wasn’t her area of practice. Obviously, she thought I should have the right doctor examine me, but unfortunately, I did not have health insurance at that time. Although I was CIPP’d, I was uneducated about what that meant and that I could’ve used that for insurance. I finally saw the Menagerie’s sponsor, Specific Family Chiropractic in Maplewood, MN, where they took the x-rays I included here. While I cannot decipher the x-rays, I was informed that some disc(s) is/are compressed, which causes disc dehydration and deterioration over time, and the tears I didn’t know existed in my neck and back muscles likely scarred. I got my body cracked and massaged twice a week at first. This year I only went once every three weeks. It’s a long road to recovery, especially when you continue to play rugby and don’t follow the treatment plan to the T! It was my responsibility to look out for myself, but I also want to encourage coaches, captains, and teammates to watch out for the players they know will play to the death for the team. Those players will break down faster and have shorter careers than if others share their knowledge and experience to caution young, fearless players to take proper care of their bodies, regardless of whether the roster is short. Tackle better! This story is why we are coached NOT to pull ball-carriers on top of ourselves. Take care of your bodies for a long, happy, and healthy rugby career. Have insurance and educate yourself on the insurance benefits of CIPP’ing. Look out for your mates. The ones with a lot of gusto are just as breakable as anyone. It seems to be contact-sport culture to guilt athletes into playing in poor medical condition. I hear the movie, “Concussion,” is a good one. Had a bad injury yourself? Tell us about it and get 50% off your next order. Use the coupon code on any of our supplements or stacks including our new recovery-focused stack, Ruck Recovery (Pro) which is still available at it’s introductory price.